Identifying cost-effective treatments for chronic low back pain (CLBP) remains a challenge for clinicians, researchers, payers and patients. About $26 billion is spent annually in the United States in direct costs of medical care for back pain . In 2002, the estimated costs of lost worker productivity due to back pain were $19.8 billion . Despite numerous options for evaluating and treating back pain, as well as the greatly increased medical care resources devoted to this problem, the health and functional status of persons with back pain in the United States has deteriorated . Furthermore, both providers and patients are dissatisfied with the status quo [4–6] and continue to search for better treatment options. There is substantial evidence that patient psychosocial factors, such as pain-related beliefs, thoughts and coping behaviors, can have a significant impact on the experience of pain and its effects on functioning . This evidence highlights the potential value of treatments for back pain that address both the mind and the body. In fact, four of the eight nonpharmacologic treatments recommended by the American College of Physicians and the American Pain Society guidelines for persistent back pain include “mind–body” components . One of these treatments, cognitive-behavioral therapy (CBT), includes mind–body components such as relaxation training and has been found to be effective for a variety of chronic pain problems, including back pain [9–13]. CBT has become the most widely applied psychosocial treatment for patients with chronic back pain. Another mind–body therapy, mindfulness-based stress reduction (MBSR) [14, 15], focuses on teaching techniques to increase mindfulness. MBSR and related mindfulness-based interventions have been found to be helpful for a broad range of mental and physical health conditions, including chronic pain [14–19], but they have not been well-studied for chronic back pain [20–24]. Only a few small pilot trials have evaluated the effectiveness of MBSR for back pain [25, 26] and all reported improvements in pain intensity  or patients’ acceptance of pain [28, 29]. Flowchart of the trial protocol. CBT, Cognitive-behavioral therapy; MBSR, Mindfulness-based stress reduction. We are recruiting individuals from 20 to 70 years of age whose back pain has persisted for at least 3 months. The inclusion and exclusion criteria were developed to maximize the enrollment of appropriate patients while screening out patients who have low back pain of a specific nature (for example, spinal stenosis) or a complicated nature or who would have difficulty completing the study measures or interventions (for example, psychosis). Reasons for exclusion of GHC members were identified on the basis of (1) automated data recorded (using the International Classification of Diseases, Ninth Revision coding system), during all visits over the course of the previous year and (2) eligibility interviews conducted by telephone. For non-GHC members, reasons for exclusion were identified on the basis of telephone interviews. Tables 1 and 2 list the inclusion and exclusion criteria, respectively, as well as the rationale for each criterion and the information sources. Initial targeting of members with back pain visits in recent past is an efficient method of identifying persons with chronic back pain. Nonmembers of GHC included to ensure that recruitment goals are met. Chronic back pain in children is a result of causes different from those we will study. Adults have a higher risk of undiagnosed serious conditions that cause back pain. These codes are consistent with low back pain that is nonspecific and uncomplicated. GHC, Group Health Cooperative; ICD-9, International Classification of Diseases, Ninth Revision. A, Automated data gathered from visits; TI, Telephone interview. aA, Automated data gathered from visits; TI, Telephone interview. After completing the baseline assessment, participants will be randomized in equal proportions to the MBSR, CBT or usual care group. Those randomized to the MBSR or CBT group will not be informed of their type of treatment until they arrive at the first classes, which will occur simultaneously in the same building. The intervention group will be assigned on the basis of a computer-generated sequence of random numbers using a program which ensures that allocation cannot be changed after randomization. To ensure balance on a key baseline prognostic factor, randomization will be stratified based on our primary outcome measurement instrument: the modified version of the Roland Disability Questionnaire (RDQ) [30, 31]. We will stratify participants into two activity limitations groups: moderate (RDQ score ≤12 on a 0 to 23 scale) and high (RDQ scores ≥13). Participants will be randomized within these strata in blocks of varying size (three, six or nine) to ensure a balanced but unpredictable assignment of participants. During recruitment, the study biostatistician will receive aggregated counts of participants randomized to each group to assure that the preprogrammed randomization algorithm is functioning properly. Mindfulness-based stress reduction, a 30-year-old treatment program developed by Jon Kabat-Zinn, is well-described in the literature [32–34]. The authors of a recent meta-analysis found that MBSR had moderate effect sizes for improving the physical and mental well-being of patients with a variety of health conditions . Our MBSR program is closely modeled on the original one and includes eight weekly 2-hour classes (summarized in Table 3), a 6-hour retreat between weeks 6 and 7 and up to 45 minutes per day of home practice. Our MBSR protocol was adapted by a senior MBSR instructor from the 2009 MBSR instructor’s manual used at the University of Massachusetts . This manual permits latitude in how instructors introduce mindfulness and its practice to participants. The handouts and home practice materials are standardized for this study. aCBT, Cognitive-behavioral therapy; MBSR, Mindfulness-based stress reduction. CBT for chronic pain is well-described in the literature and has been found to be modestly to moderately effective in improving chronic pain problems [9–13]. There is no single, standardized CBT intervention for chronic pain, although all CBT interventions are based on the assumption that both cognition and behavior influence adaptation to chronic pain and that maladaptive cognition and behavior can be identified and changed to improve patient functioning . CBT emphasizes active, structured techniques to teach patients how to identify, monitor and change maladaptive thoughts, feelings and behaviors, with a focus on helping patients to acquire skills that they can apply to a variety of problems and collaboration between the patient and therapist. A variety of techniques are taught, including training in pain coping skills (for example, use of positive coping self-statements, distraction, relaxation and problem-solving). CBT also promotes setting and working toward behavioral goals. Both individual and group formats have been used in CBT. Group CBT is often an important component of multidisciplinary pain treatment programs. We will use a group CBT format because it has been found to be efficacious [37–40], is more resource-efficient than individual therapy and provides patients with the potential benefits deriving from contact with, and support and encouragement from, others with similar experiences and problems. In addition, using group formats for both MBSR and CBT will eliminate intervention format as a possible explanation for any differences observed between the two therapies. For this study, we developed a detailed therapist’s manual with content specific for each session, as well as a participant’s workbook containing materials for use in each session. We developed the therapist’s manual and participant’s workbooks based on existing published resources as well as on materials we have used in prior studies [39–47]. aCBT, Cognitive-behavioral therapy; CPAQ-8, 8-item Chronic Pain Acceptance Questionnaire; CPCI, Chronic Pain Coping Inventory; EQ-5D, European Quality of Life (EuroQol) instrument in 5 dimensions; FFMQ, Five Facet Mindfulness Questionnaire; GAD-2, 2-item Generalized Anxiety Disorder scale; GCPS, Graded Chronic Pain Scale; MBSR, Mindfulness-based stress reduction; PCS, Pain Catastrophizing Scale; PGIC, Patient Global Impression of Change scale; PHQ-8,8 item Patient Health Questionnaire; PSEQ, Patient Self-efficacy Questionnaire; RDQ, Roland Disability Questionnaire; SF-6D, Short Form Health Survey in 6 dimensions; SF-12, 12-item Short Form Health Survey; SOPA, Survey of Pain Attitudes; WPAI-CLBP, Work Productivity and Activity Impairment Questionnaire–Chronic Low Back Pain. Back-related activity limitations will be measured with the modified RDQ, which asks whether 23 specific activities have been limited due to back pain (yes or no) . We have further modified the RDQ to ask a question about the previous week rather than just “today”. The original RDQ has been found to be reliable, valid and sensitive to clinical changes [31, 48, 50–53], and it is appropriate for telephone administration and use with patients with moderate activity limitations . We will analyze and report these co–primary outcomes in two ways. First, for our primary endpoint analyses, we will compare the percentages of participants in the three treatment groups who achieve clinically meaningful improvement (≥30% improvement from baseline) [56, 57] at each time point (with 26-week follow-up being the primary endpoint). We will then examine, in a secondary outcome analysis, the adjusted mean differences between groups on these measures at the time of follow-up. Depressive symptoms will be assessed with the Patient Health Questionnaire-8 (PHQ-8) . With the exception of the elimination of a question about suicidal ideation, the PHQ-8 is identical to the PHQ-9, which has been found to be reliable, valid and responsive to change [59, 60]. Anxiety will be measured with the 2-item Generalized Anxiety Disorder scale (GAD-2), which has demonstrated high sensitivity and specificity in detecting generalized anxiety disorder in primary care populations [61, 62]. Pain-related activity interference with daily activities will be assessed using three items from the Graded Chronic Pain Scale (GCPS). The GCPS has been validated and shown to have good psychometric properties in a large population survey and in large samples of primary care patients with pain [63, 64]. Participants will be asked to rate the following three items on a 0 to 10 scale: their current back pain (back pain “right now”), their worst back pain in the previous month and their average pain level over the previous month. In the MBSR arm, we will evaluate the mediating effects of increased mindfulness (measured with the Nonreactivity, Observing, Acting with Awareness, and Nonjudging subscales of the Five Facet Mindfulness Questionnaire short form [68–70]) and increased pain acceptance (measured with the Chronic Pain Acceptance Questionnaire [71, 72]) on the primary outcomes. In the CBT arm, we will evaluate the mediating effects of improvements in pain beliefs and/or appraisals (measured with the Patient Self-Efficacy Questionnaire ; the Survey of Pain Attitudes 2-item Control, Disability, and Harm scales [74–76]; and the Pain Catastrophizing Scale [77–80]) and changes in the use of pain coping strategies (measured with the Chronic Pain Coping Inventory 2-item Relaxation scale and the complete Activity Pacing scale [81, 82]) on the primary outcomes. Although we expect the effects of MBSR and CBT on outcomes to be mediated by different variables, we will explore the effects of all potential mediators on outcomes in both treatment groups. Because of multiple comparisons, we will use Fisher’s protected least significant difference test , first analyzing if there is any significant difference among all three groups (using the omnibus χ 2 likelihood ratio test) for each outcome and each time point. If we find a difference, we will then test for pairwise differences between groups. We will need 264 participants (88 in each group) to achieve 90% power to find either mind–body treatment different from usual care on the RDQ. 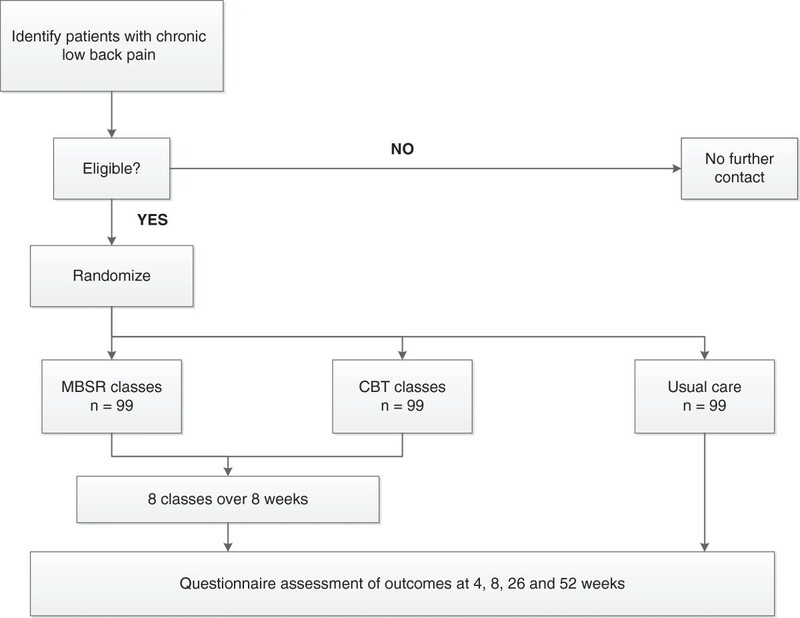 This assumes that 30% of the usual care group and 55% of each mind–body treatment group will have clinically meaningful improvement on the RDQ at 26 weeks, rates of improvement that are similar to those we observed in a similar back pain population in an evaluation of complementary and alternative treatments for back pain . We will have at least 80% power to detect a significant difference between MBSR and CBT on the RDQ if MBSR is at least 20 percentage points more effective than CBT (that is, 75% of the MBSR group versus 55% of the CBT group). where y t is the response at follow-up time t, baseline is the prerandomization value of the outcome measure, treatment includes dummy variables for the MBSR and CBT groups, time is a series of dummy variables indicating the follow-up times and z is a vector of covariates representing other variables adjusted for. (Note that α1, α2, α3 and α4 are vectors.) The referent group in this model is the usual care group. For binary and continuous outcomes, we will use appropriate link functions (for example, logit for binary). For each follow-up time point at which the omnibus χ 2 test is statistically significant, we will go on to test whether there is a difference between MBSR and usual care to address aim 1 and a difference between MBSR and CBT to address aim 2. We will also report the comparison of CBT to usual care. When determining whether MBSR is an effective treatment for back pain, we will require that aim 1, the comparison of MBSR to usual care, must be observed. If MBSR or CBT is found to be effective (relative to usual care and/or to each other) in improving either primary outcome at 26 or 52 weeks, we will move to aim 3 to identify the mediators of the effects of MBSR and group CBT on the RDQ and pain bothersomeness scale. We will perform the series of mediation analyses separately for the two primary outcomes (RDQ and pain bothersomeness scale scores) and for each separate treatment comparator of interest (usual care versus CBT, usual care versus MBSR and CBT versus MBSR). We will conduct separate mediator analyses for the 26- and 52-week outcomes (if MBSR or CBT is found to be effective at those time points). A societal perspective cost–utility analysis (CUA) will be performed to compare the incremental societal costs revealed for each treatment arm (direct medical costs paid by GHC and the participant plus productivity costs) to incremental effectiveness in terms of change in participants’ QALYs . This analysis will be possible only for study participants recruited from GHC. This CUA can be used by policymakers concerned with the broad allocation of health-related resources [94, 95]. For the payer perspective, direct medical costs (including intervention costs) will be compared to changes in QALYs. This CUA will help us to determine whether it makes economic sense for MBSR to be a reimbursed service among this population. A bootstrap methodology will be used to estimate confidence intervals . In secondary analyses conducted to assess the sensitivity of the results to different cost outcome definitions, such as varying assumptions of wage rates used to value productivity and the inclusion of non-back-related health-care resource utilization  in the total cost amounts, will also be considered. In cost-effectiveness analyses, we will use intention to treat and adjust for health-care utilization costs in the one calendar year prior to enrollment and for baseline variables that might be associated with treatment group or outcome, such as medication use, to control for potential confounders. We expect there will be minimal missing data, but sensitivity analyses (as described above for the primary outcomes) will also be performed to assess cost measures.